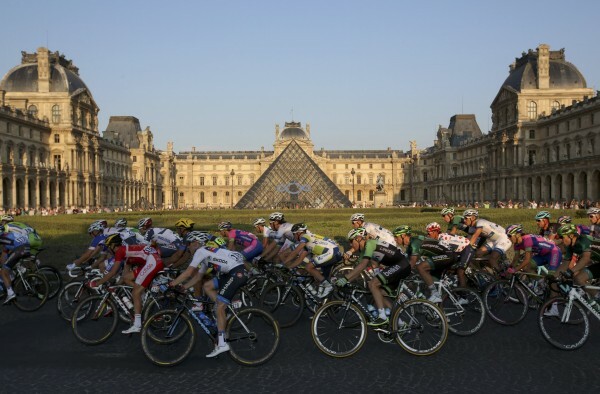 The pack of riders cycles past the Louvre Museum during the final stage of the centenary Tour de France cycling race from Versailles to Paris Champs Elysees, July 21, 2013. AMSTERDAM — French riders in the Tour de France live an average of six years longer than the general population and die less often of cardiovascular problems, researchers said, which may help ease worries about the effect of extreme exercise on the heart. The research also offered limited assurance that doping was unlikely to pose a major heart health risk, at least in the short term, since any major adverse impact would have skewed the results. Illicit use of the blood-boosting drug EPO, or erythropoietin, has been rampant in competitive cycling since the 1990s. The study presented at the European Society of Cardiology congress on Tuesday examined all 786 French competitors in the gruelling bicycle race from 1947 to 2012, and found their death rate was 41 percent lower than average for French males as of last September. Dr. Xavier Jouven of the European Georges Pompidou Hospital in Paris, who led the analysis, said the mortality reduction was “huge” and the result suggested that doctors should be more assertive in championing vigorous exercise. Riders in the Tour de France — which has been compared to running a marathon several days a week for nearly three weeks — actually had a 33 percent lower risk for death from heart attacks or strokes than the general population. Indeed, they suffered lower rates of death from all causes, including cancer, with the one exception of traumatic injury, which Jouven said reflected the frequency of road accidents. Worries about high-intensity exercise like cycling and marathon-running have been fuelled by some previous small studies using advanced imaging techniques that suggested possible heart abnormalities, such as heart arrhythmias. Alfred Bove of Temple University Medical Center and a former president of the American College of Cardiology, who was not involved in the latest study, said such imaging data could be misleading. The long-term analysis of Tour de France riders offered a unique insight that clearly vindicated the value of extensive exercise, Bove said. “The message is clear — even the level of intensity involved in the Tour de France is not going to shorten your life,” he said. The study did not adjust for different smoking rates among cyclists, but Bove argued this was “essentially irrelevant”. “If exercise and a commitment to that kind of lifestyle makes you stop smoking, then that is an additional benefit,” he said. The French cyclists studied took part in a median 2.5 Tour de France races and their median age at the first race was 25 years.